For many in the US, the term Chablis is synonymous with those honker boxes of Franzia your spinster aunt used to plow through with alarming enthusiasm. But Chablis is actually a place - the place - where chardonnay first found fame. Sitting at the north end of Burgundy, the area is cooler, producing wines of greater tension and energy. There's little flab and plenty of acidity in these whites. Like much of Burgundy, Chablis is often a label that carries a hefty price tag. So, it's only at the fringes of the region where I can afford to experiment. I recently took a flier a marked-down bottle of Chablis. 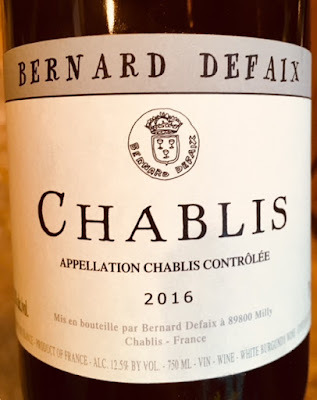 The producer was not familiar to me, and the quality of 2016 in Burgundy was also an unknown, but the reduced price ($20) seemed like a fun splurge while on vacation. What the hell, right? On reflection, it was perhaps the best $20 I've spent on wine in a long time. Part of the reward was certainly in how unexpectedly delightful the wine was. And, yes, it was balanced and brilliant and crackling with energy, but what was perhaps most appealing about this wine was the simple way in which it channeled its complexity. There was no shouting coming from the glass, no show-boating or overt, caricature-like characteristics. Instead, a poise and self-assured calmness that made it highly companionable. Suddenly that $20 seems like a screaming bargain.